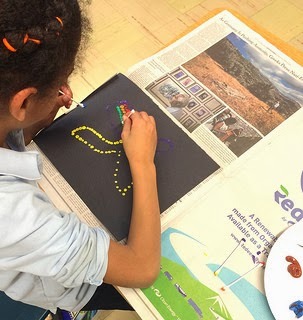 Last week, 3rd graders at JFK Elementary School in Jamaica Plain, MA got messy with paint creating spirit animals! Since students have been studying ancient cultures and religions, teaching artist Iemanja Wells-Wingfield connected the art movement of Pointillism with Aborigine culture. 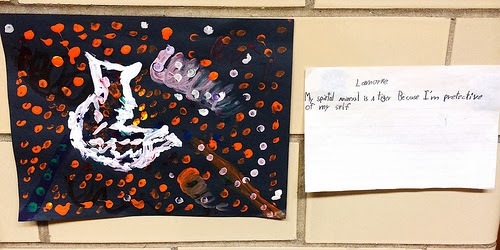 To engage the students, she designed a project where students would get to experience this for themselves and create their own spirit animals using Aboriginal and pointillist elements. The class began by learning about color theory, first discussing primary vs. secondary colors, then learning about different color tones, warm vs. cool tones. Do you know what optical mixing is? 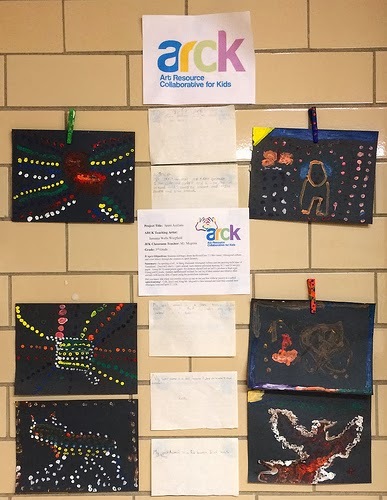 Well, the students at JFK Elementary learned that optical mixing is a technique that overlays colors on top of one another without mixing them. They then discussed Aboriginal cultures and the painting technique of Pointillism, a style of painting using small dots of color to create a larger image. Combining what they had learned, each student chose a spirit animal ranging from snakes to birds to dogs, bears, and even a lion. 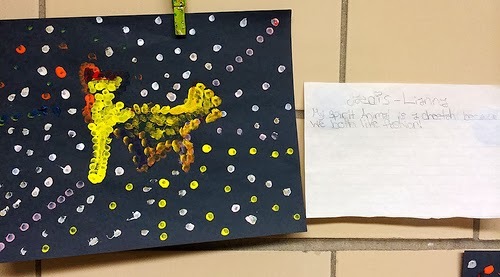 One student wrote “My spirit animal is a swan because I am pretty and elegant.” Another student wrote, “My spirit animal is a viper because I am fast and furious.” Using black construction paper, the students created an outline of their animals. 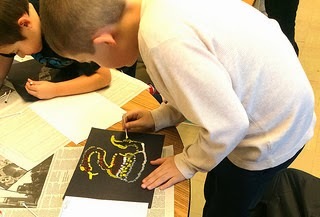 Students then chose a color scheme and, using cotton swabs, dabbed paint around the outline of their animal and filled in their animals with acrylic dots of paint using the pointillism technique. Check out some of their work below!